After a ten-year absence from the silver screen, Hellboy — a.k.a. Big Red, a.k.a. 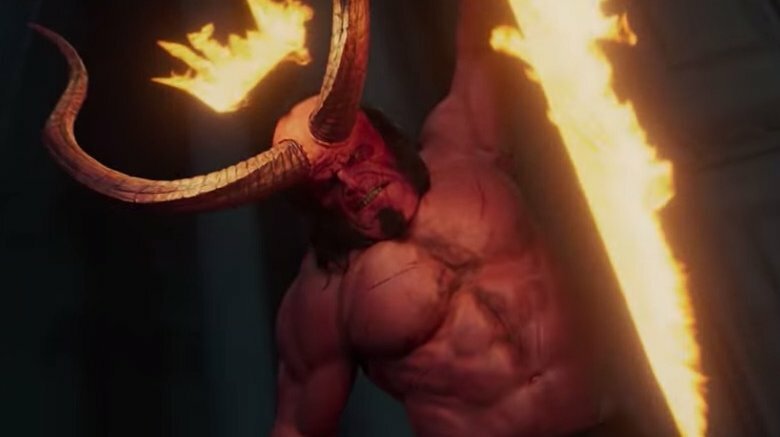 Anung Un Rama — finally made his gruesome cinematic return in 2019's appropriately titled Hellboy, a two-hour gore-a-thon directed by Neil Marshall (The Descent). Granted, this is a full-throttle reboot of the franchise rather than a continuation of the original Hellboy films directed by Guillermo del Toro, who confirmed on Twitter in February 2017 that Hellboy 3 "will not happen." The new film unfolds at such a breakneck pace, even fervent fans of the original Mike Mignola comics might be continually scratching their heads. (That's one of many reasons this "fresh hell" of a film isn't exactly "certified fresh" on Rotten Tomatoes.) 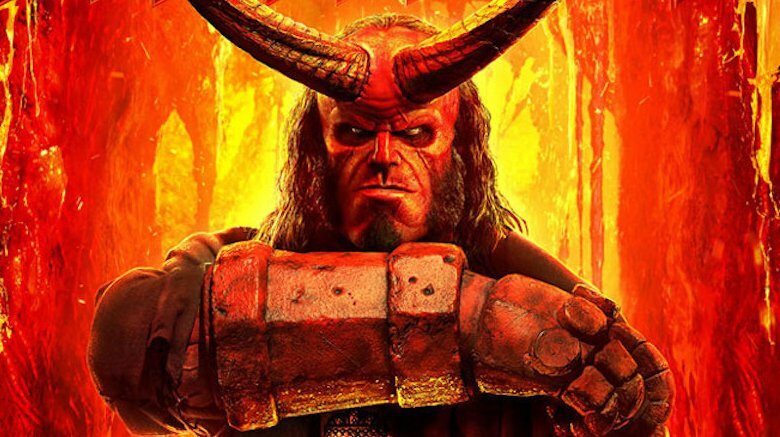 Amid all the crushed skulls, distended eyeballs, and severed limbs, Hellboy leaves more than a few loose ends in its wake — including an epilogue, a mid-credits scene, and a post-credits scene. Let's try to unpack the ending of Hellboy, and see if it sheds some light on the hour and 45 minutes that precedes it. Spoilers ahead. ​Before the end? There's the beginning and middle. 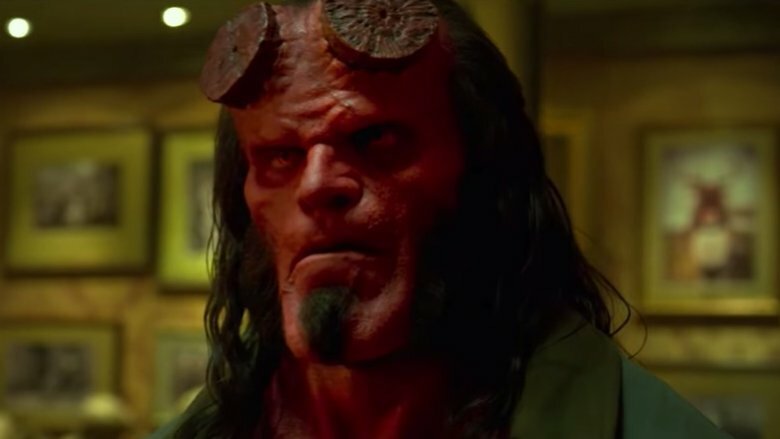 In her two-star review, Katie Walsh of the Tribune News Service warns that attempting to summarize Hellboy's disjointed plot is "a fool's errand," but let's give it a whirl anyway. In a blood-spattered nutshell, the film follows the titular half-man, half-hellbeast (portrayed by Stranger Things' David Harbour, filling the formidable shoes of Ron Perlman, who starred in Guillermo del Toro's Hellboy films). The story grabs imagery from the original comic book series seemingly at random, cribbing plot points and characters from Seed of Destruction, The Wild Hunt, and The Storm and the Fury, among others. Hellboy works alongside his adoptive father, Professor Trevor Bruttenholm (Deadwood's Ian McShane) at the Bureau for Paranormal Research and Defense (BPRD), a shadowy organization that battles supernatural creepos. Throughout the film, Hellboy is hot on the trail of a spiteful witch named Vivian Nimue, a.k.a the Blood Queen (portrayed by Resident Evil star Milla Jovovich). In a flashback sequence that opens the film, Nimue is chopped to bits by none other than King Arthur (Mark Stanley), who cleaves her up with his mighty sword Excalibur. Nimue's body parts are thus scattered throughout the land, and they remain buried for 1,500 years — an admirable run for any dead sorceress. Alas, the Blood Queen is eventually pieced back together by her willing supplicant, the humanoid warthog Gruagach (voiced by Stephen Graham). Now, Hellboy must stop Nimue before she destroys humanity… along the way battling vampires, giants, backstabbing occultists, zombies, and his own tormented soul. Somewhere, buried deep beneath the mounds of rotting flesh and gouged-out eyeballs, there's a story of a creature searching for his place in the world. When Hellboy grumbles lines like "monsters don't have to hide in the shadows," they're easily lost amid the knobs of bone and viscera splashing slipshod across the monastery walls. If we were to boil down Hellboy's central dilemma, we'd say he vacillates wildly between sympathizing with the supernatural underworld and all of its murderous intent, and siding with us humans; comparably inept but also murderous at heart. Frankly, it's easy to understand Hellboy's pain, as more of less every major character — whether human, inhuman, or something in between — appears to be conspiring to kill him at some point or another. The sole exception is Professor Bruttenholm, who merely holds Hellboy in barely contained contempt through much of the film. At various points, Hellboy appears really down on humans — although it's not altogether clear why. After all, he barrels down the streets openly and commands respect everywhere he goes. When Hellboy gets blackout drunk in a dive bar in Tijuana, the bartender reverently hands him a whole bottle of tequila while he's being escorted out. Enabling, yes — but respectful! Throughout the film, humans regard him with fear and wonder and more fear… yet he still curses the wanton caprices of man. What we're saying here: This is a half-man, half-beast who has some growing up to do. As the film batters, burns, and blasts its way towards a conclusion, we come to learn that Hellboy is, in fact, a descendant of King Arthur himself. In fact, he's the spawn of a a ne'er-do-well demon and a sprightly witch named Sarah Hughes, also of Arthurian descent. This exposition is revealed by none other than the wizard Merlin, awakened by Hellboy from his tombed slumber just long enough to provide us with this overwhelming info dump. His duty done, Merlin promptly disintegrates into dust, lazy eye and all. 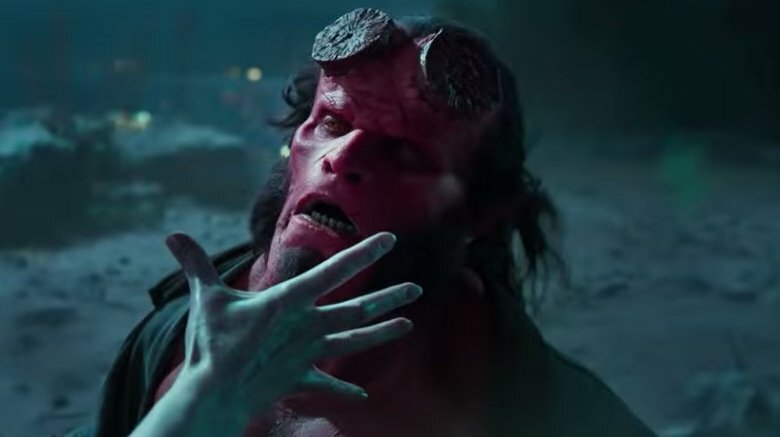 In the final confrontation, Nimue the Blood Queen temporarily seduces Hellboy to the dark(er) side of the crystal after killing Professor Bruttenholm before his eyes. Hellboy is garlanded in a kicky crown of hellfire and immediately grows his horns out, because he's evil now. As Nimue's squalid squadron of unearthly creatures rip and rend through the terrified London streets to giddily flay innumerable innocent civilians, Nimue focuses on spreading supernatural pestilence across the land. Hellboy ultimately comes to his senses after getting lost in the moment. Meanwhile, the Bureau for Paranormal Research and Defense only learns of the unfolding apocalypse by chancing upon a live news broadcast. They didn't have their own intel? Hellboy ultimately decides to follow the path of the righteous. Rather than end humanity, he overpowers Nimue, decapitates her with Excalibur, and sends her still-screaming head back into the fiery fathoms of hell. Ominously, she warns she'll be back. Frankly, we have our doubts. ​What's up with that fish tank in Siberia? In the film's final set piece, Hellboy finds himself on an ostensibly dangerous mission in Siberia with his two trusty cohorts from the BPRD: scrappy spirit medium Alice Monaghan (portrayed by Sasha Lane) and scarred, moody Ben Daimio (Daniel Dae Kim), a down-low were-jaguar whose theoretically British accent also has a penchant for shapeshifting. Whuh to the huh? If you've read the comics or seen the Guillermo del Toro films, the name Abe Sapien will surely mean something to you: Although he may be half-man and half-amphibian, the character is entirely badass, and he's practically as famous as Hellboy himself. 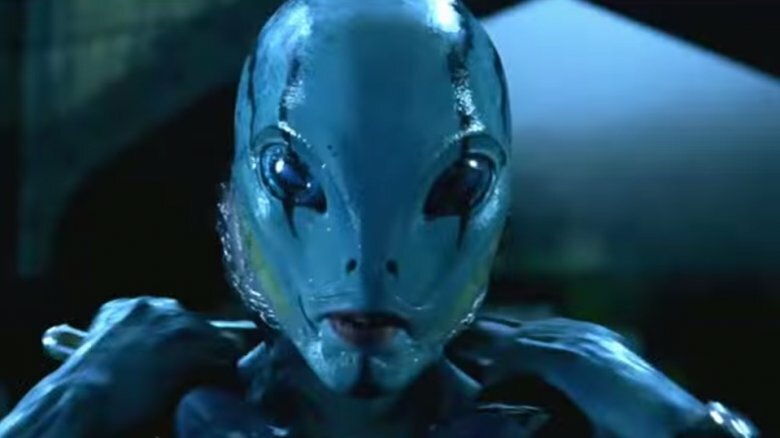 Portrayed by Doug Jones in del Toro's films, Abe Sapien was once a man named Langdon Everett who dabbled in the occult and paid the ultimate price: He turned into some half-fish monstrosity. In the universe of this rebooted Hellboy, Abe Sapien may be doubly cursed, as he's being teased for a sequel that will likely never see the light of day. In keeping with its maximalist, everything-including-the-bloodstained-kitchen sink aesthetic, Hellboy throws not one but two scenes into the end credits — a bonafide one-two punch of inscrutability that will make a bit more sense if you've read the comics. In the mid-credits scene, we find Hellboy drowning his beastly sorrows by boozing it up in a graveyard, mourning the recent death of his mentor and adoptive father, Professor Trevor Bruttenholm. 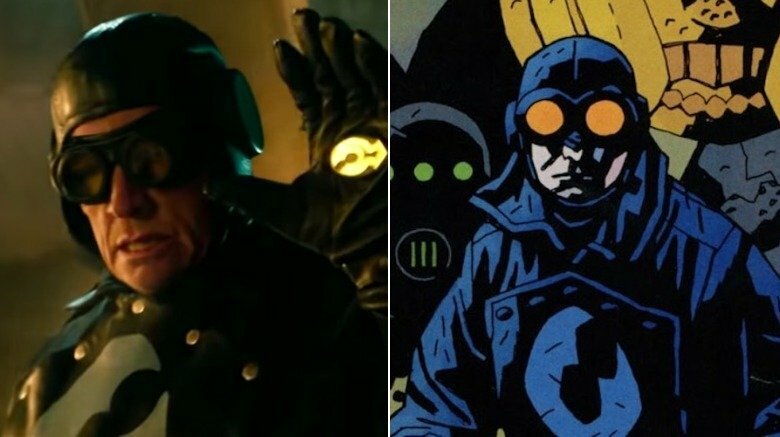 So why were we expected to pump our fists every time this Lobster Johnson fellow entered the frame? A beloved character in the Hellboy universe, this dashing crusader made his first appearance in Hellboy: Box Full of Evil #1 and later starred in his own spinoff comic series. He's a vigilante who plays by his own rules, and he's fond of searing his signature "lobster claw" symbol into the foreheads of his enemies as they screech and beg for mercy. So… what's not to like? ​What is Baba Yaga going on about this time? 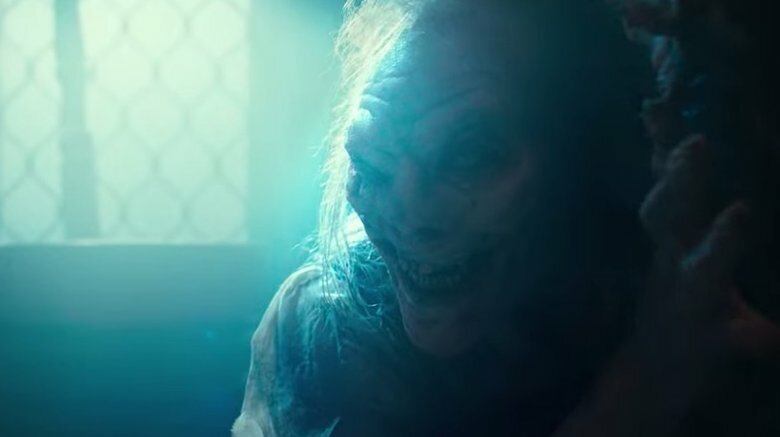 During his quest to find Nimue the Blood Queen, Hellboy pays a visit to Baba Yaga, a haggard, floppy, and fiercely discombobulated witch who scuttles around via spider-walk, a la Linda Blair in The Exorcist. The two unearthly creatures sit down to dinner at her well-appointed cottage, which exists in some far-off eldritch dimension and lumbers around on monstrously shambling chicken legs. Baba Yaga promptly serves Hellboy a generous helping of soup made from the flesh of a human child. He declines. Baba Yaga promptly does Hellboy a solid, offering up some clues as to Nimue's whereabouts. However, the intel comes at a cost: Hellboy must give her one of his eyeballs. He agrees, and they make a sacred pact via the most nauseatingly drooly kiss in cinematic history. Fortunately, he manages to escape the cottage with both eyeballs intact. But for how long? In a post-credits scene, we return to Baba Yaga's cottage, where she's convincing an unseen accomplice to murder Hellboy at his earliest convenience and hand over the hellish eye she was promised! Who knows who she's talking to? The Los Angeles Times seems to think it's Koschei the Deathless, a seemingly "immortal" assassin that appears in the Darkness Falls graphic novel by Mike Mignola and Duncan Fegredo. This theory gels with the fact that Baba Yaga assures her henchman she'll mercifully end his life if he brings back Hellboy's eye. By this point, you may be willing to volunteer both of your own.